Spacious Beachfront Penthouse. Great Family Resort & Beach! Indulge yourself in the Penthouse at Island Inn. 3 bedroom, 3 bathroom condo suite on the top floor of this beachfront complex. The view from this place is simply breathtaking. Watch dolphins play in the water. Watch the sun set over the Gulf of Mexico from the top floor of this beachfront property. Although this unit does not have a walk-out balcony, the living room is designed to safely open up with large sliding doors giving an incredible, upfront open experience. The condo can accommodate up to 8 people with a comfortable King size bed in the master, a premium quality Queen size bed (new Feb 2016) in the 2nd Bedroom, two premium full size beds (new Feb 2016) in the 3rd bedroom and a full size sleep sofa in the living room. For those days when you need a break from the beach, the living room has a room-filling 55" flat screen with DVD player, the master and second bedroom have a 32" flat screen with DVD player, and the third bedroom has a 25" flat screen TV. Coin operated washer/dryer on site. Complementary private high-speed WiFi Internet for our guests. Go down the elevator and walk 30 feet to the beautiful white sand. Splash in the year-round heated beachfront pool with pool side Tiki bar. All the amenities of a top rated resort. Please note - this condo is NOT wheelchair accessible as there are steps inside. Enjoy the shopping and waterfront restaurants of Johns Pass Boardwalk to the north. 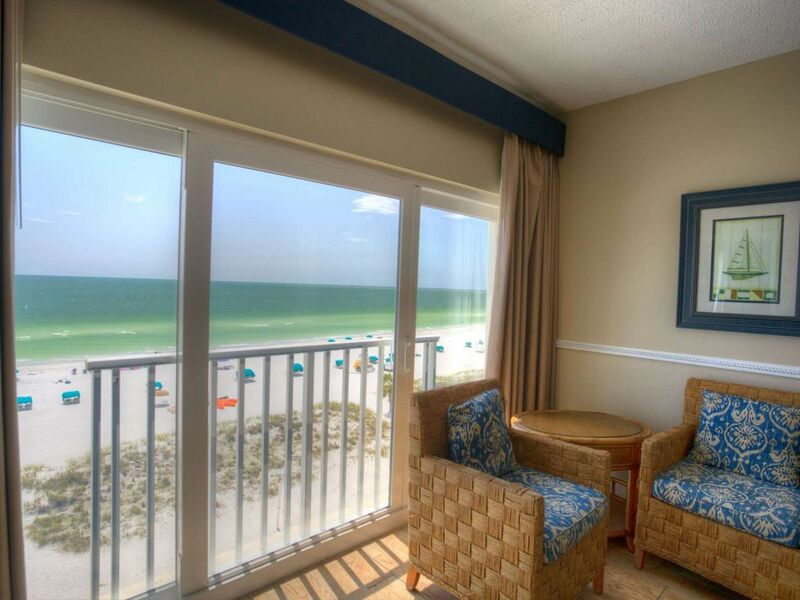 Treasure Island is conveniently located between St. Pete Beach and Clearwater. 30 minutes to the Tampa International Airport. Orlando with Disney, Universal and Sea World are just 90 minutes away. This would be a fantastic place to bring the kids on vacation, to escape the cold in the winter, and to enjoy MLB spring training. But even with all there is to do near this condo, you'll spend a lot of time just looking out your window at the magnificent view. Great location right on the beach. Condo has a beautiful view of beach and everything you need to enjoy the beach. Could be a little bit cleaner. There was a huge cockroach in one of the bathrooms. There were five of us staying here for 3 days and we loved it. Plenty of room and we could have had 8 people and still been comfortable with a lot of space for everyone. The unit is a little dated and could really use a new couch and chairs in the living room. They are quite old and not very comfortable. Kitchen was nicely equipped for cooking. Loved the views from this penthouse. Very quiet area where this is located. We walked a lot on the beach and it goes for miles. Master Bedroom mattress is "very" hard......could have been a little softer but all the other beds were fine and to everyone's liking. Bring extra extension cords with you as the plug situation is not the greatest.....especially when everyone has computers with them. Pool was adequate and they do have outside grills which was nice. Friendly staff as well. We would definitely consider coming back again. During our getaway, four couples gathered at this spacious condo for an extended weekend stay. The condo provided plenty of room for us to all convene together but not feel as though we were on top of one another while milling about. With three bathrooms, we were all easily able to primp and get ready without having to wait for the restroom to clear. The views from all of the windows were amazing. With the bay on one side and the ocean on the other... it was a win-win no matter which way you were looking. Beautiful sunrises over the water on the bay and captivating sunsets over the ocean in the evenings. The location of the condo was also a plus! We ventured on foot to many tiki bars with fun atmospheres as well as a couple local breweries. And the grocery store is only a quick Uber/Lyft ride. Quick needs are easily attainable on foot via the local convenience stores and ABC store. We would definitely stay here again! Beautiful views, comfortable spaces, friendly staff and easy to work with! Awesome Place to stay! The view was breathtaking! We loved it. It was a great place to celebrate news years eve! We were debating between 2 and 3 stars for this apartment. The location is great, you are right on the beach. but the apartment itself is really run down. first of all: the kitchen: old, the dishwasher is from 1950 and doesn't wash. there is nothing available. the peeler doesn't peel, there are no frying pans, it's almost comical, a kitchen without anything. the toaster is broken. the outlets are old, the mitten for the oven is burnt. no trivets for hot dishes. there is nothing nice about eating in the kitchen. the living room: the couch is old, smells old, sinks in. it's not inviting. the master bedroom and the kids bedroom: you need to know that you will be in the dark for the whole week, the curtains can't be pulled up and even if you could pull one for natural light, you will find yourself saying hi to people walking by. there is no light on the ceilings. the outlets are a joke: we are still trying to find them. on the picture, you see a night stand and a lamp shade but there is no outlets to plug it in. it's just there to look pretty. you can't pull the curtains either. so enjoy the dark! the bedroom with the ocean view: apart from the bed with orange stains under the sheets, looking disgusting, with a cover that has probably never been washed, the view is beautiful. all the bed covers have never been washed. they smell like people who slept in there, and drool and whatever human leftover. you get your sheets and towels for your entire stay, but no balcony for drying, no drying rack for towels. the bath towels and beach towels can get really musty and wet. we have stayed at different places where the owners tried to think of everything to make the stay enjoyable. not here. it's old, run down and not well taken care of. we looked at the unit next door, what a difference! beautiful leather couches, new beds with beautiful bedding etc..
so that's our rating. we won't come back to this unit for sure. on the plus side, itrip customer service is good. Thank you for the feedback. We are currently working on several items in the condo, and will make sure to look at each of the issues you mentioned.